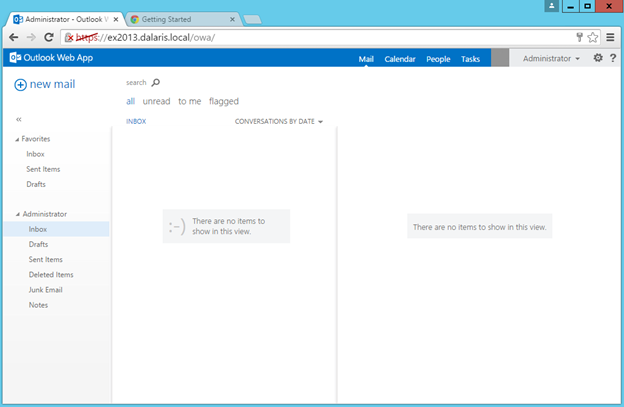 Verify Language and Time zone. 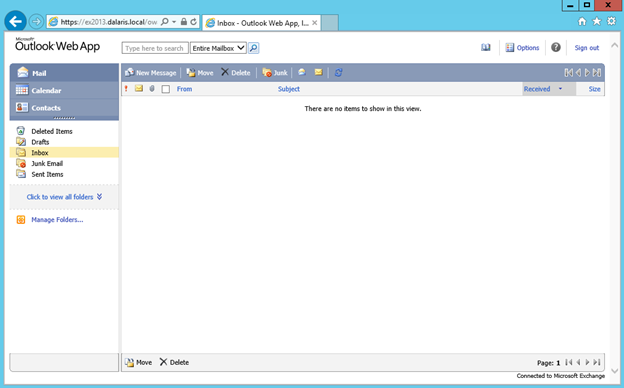 This is the main interface of OWA as shown in Internet Explorer. 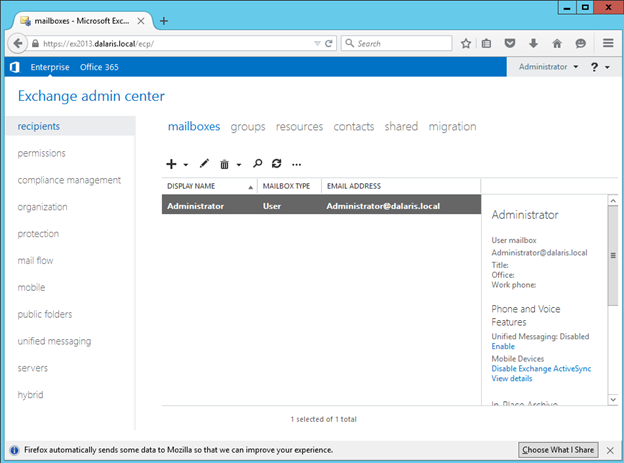 Let’s send an email from administrator@dalaris.local to exadmin@dalaris.local. 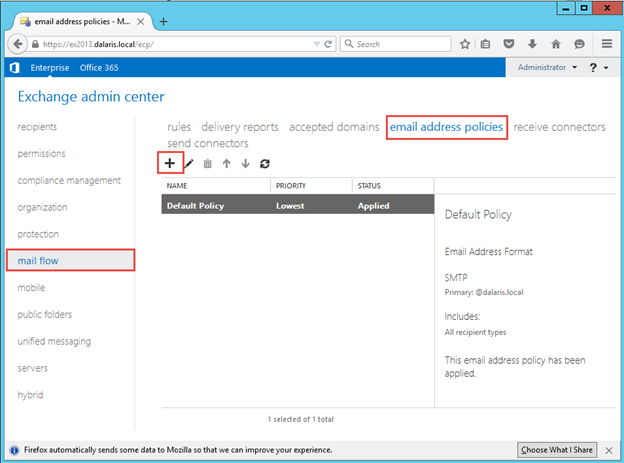 You will find that a bounced message comes back to you because ExAdmin is just a user in Active Directory without a mailbox. 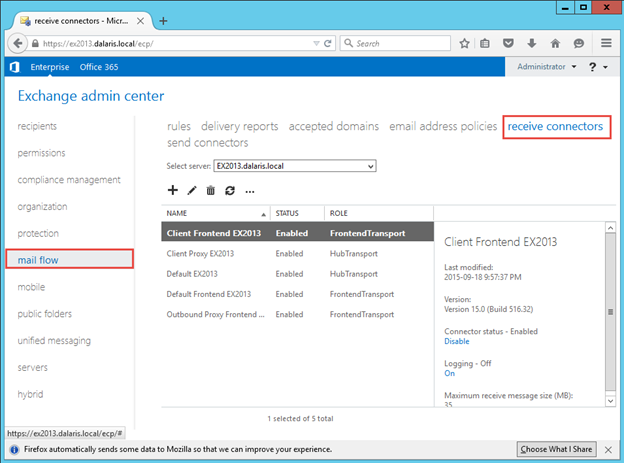 Let’s configure a couple of things to make this exchange environment up and running. ECP stands for Exchange Control Panel. The following is the main interface of ECP. 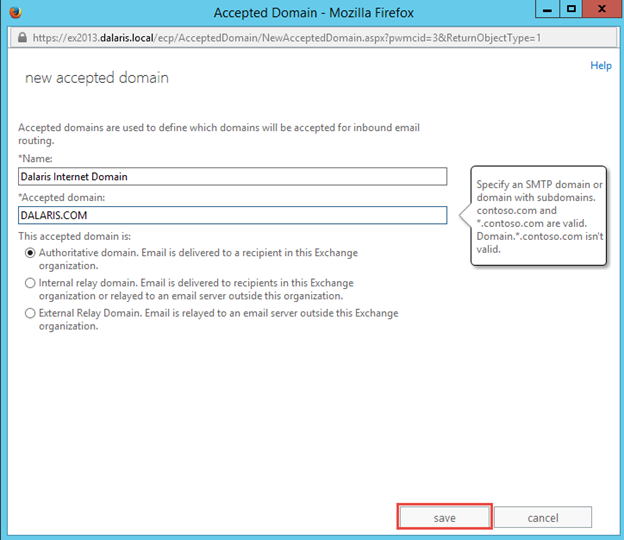 In ECP, click Mail Flow, accepted domains to create a new accepted domain. 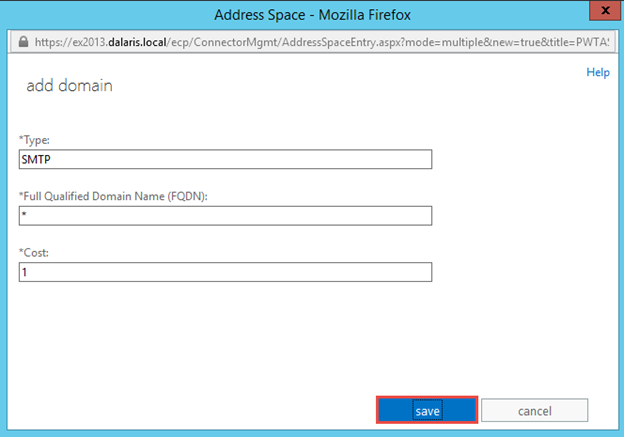 Note that the default accepted domain dalaris.local is already present. 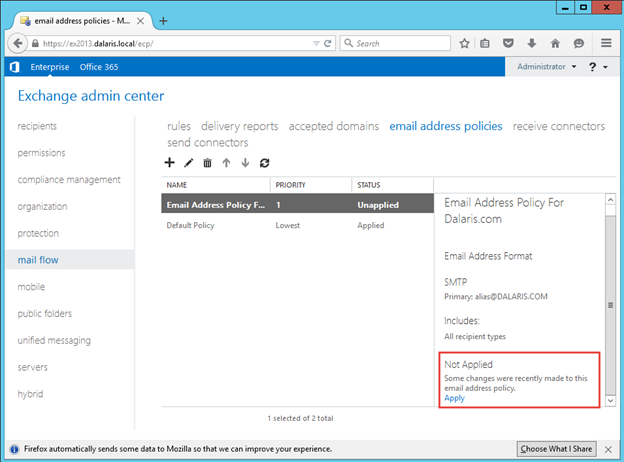 Let’s create an Internet domain to allow this exchange server to accept mail for the domain DALARIS.COM. 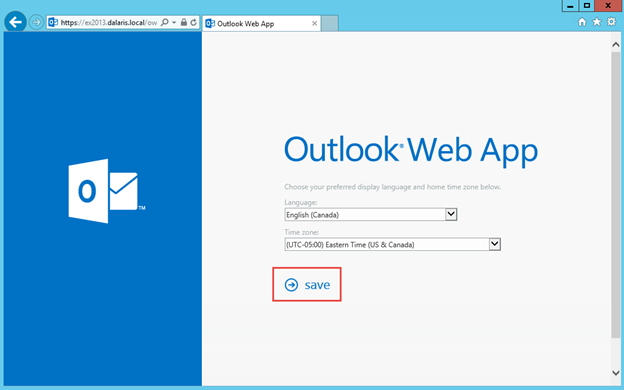 Click The + sign to do that. 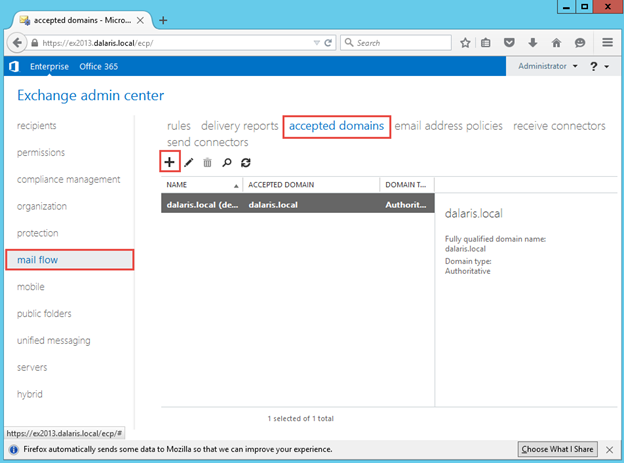 The domain type is authorotative. Click Save when done. 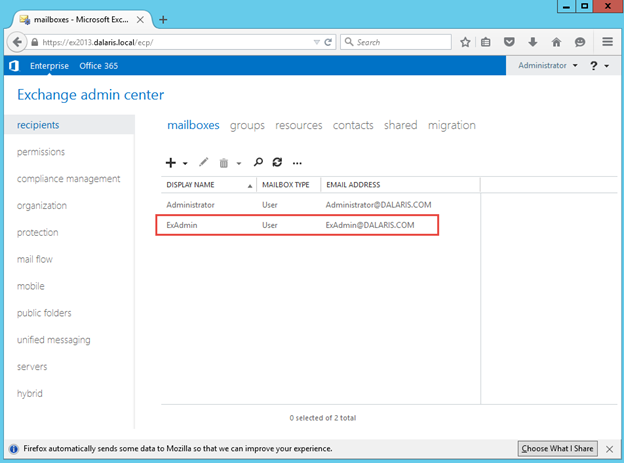 We want that every time we create a new mailbox, the new email address will be alias@dalaris.com. This is done by an Email Address Policy. 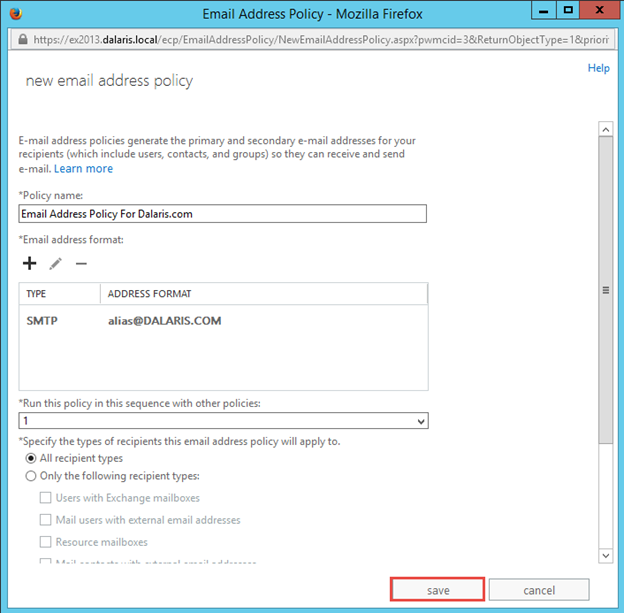 Click mail flow, email address policy, and then click the + sign. 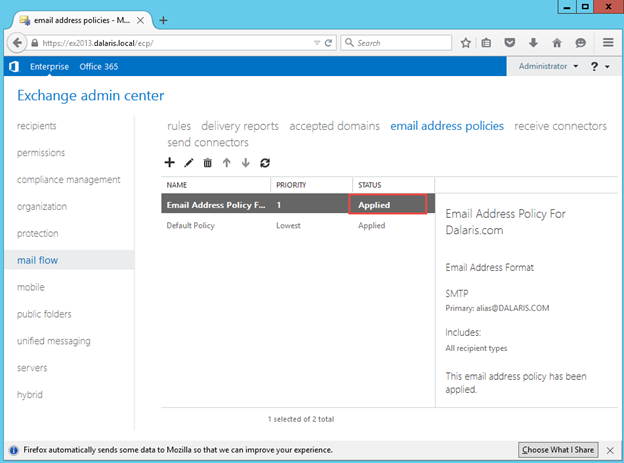 Enter the policy name and click the + sign. 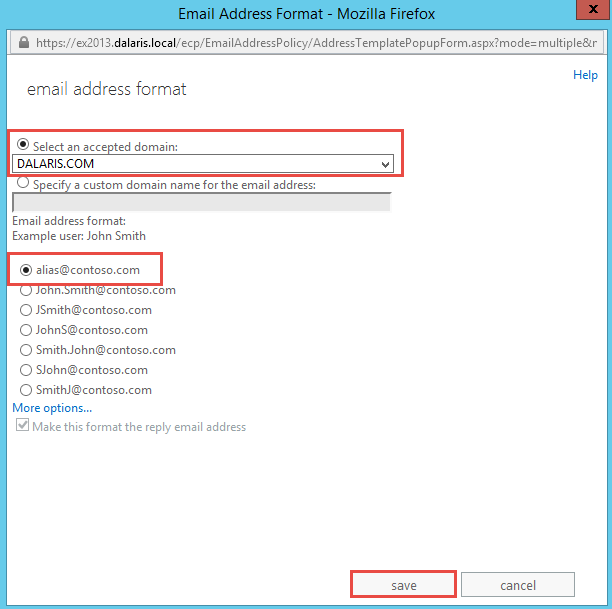 Select dalaris.com as the accepted domain and choose alias@contoso.com as the email address format. 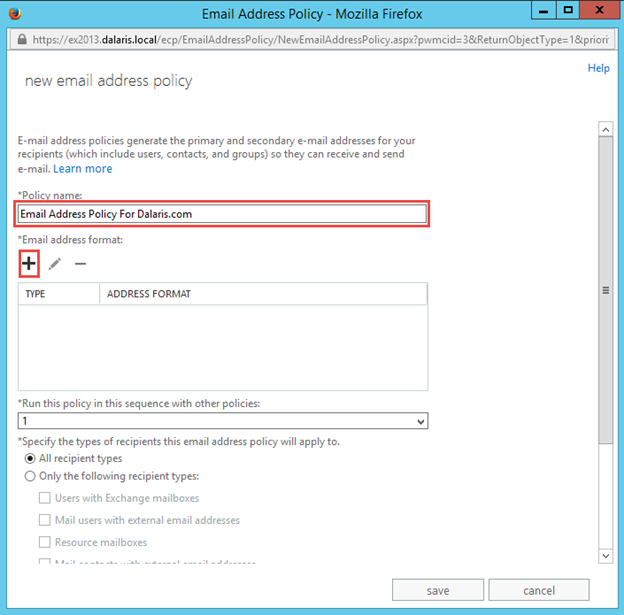 Click Save again at the Email Address Policy windows. 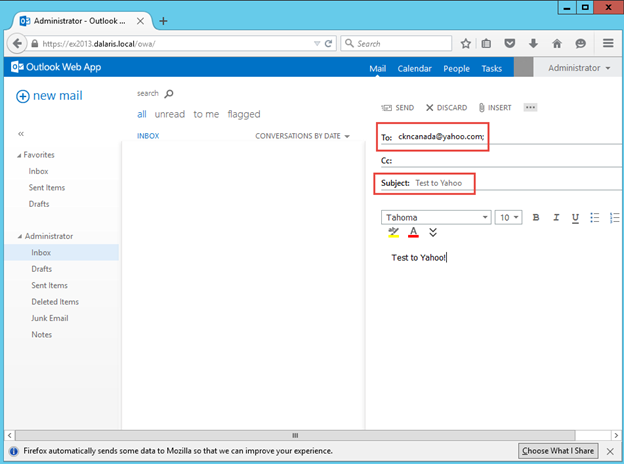 Click Apply so that all existing mailboxes will be updated with the new email address. Note the status now shows Applied. 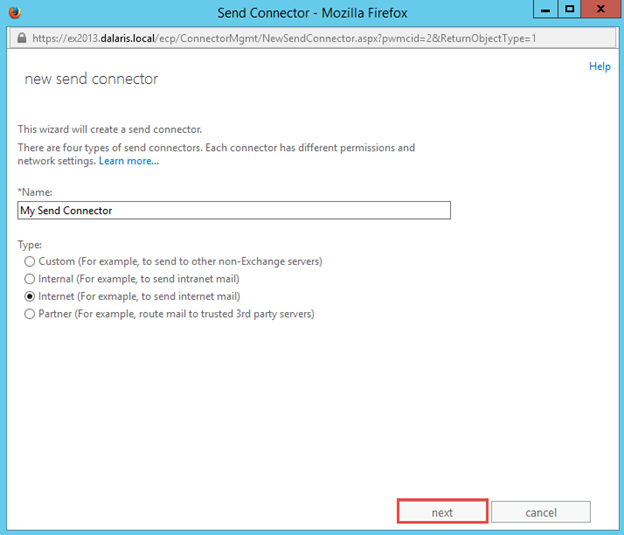 In order to send email we need to create a send connector. 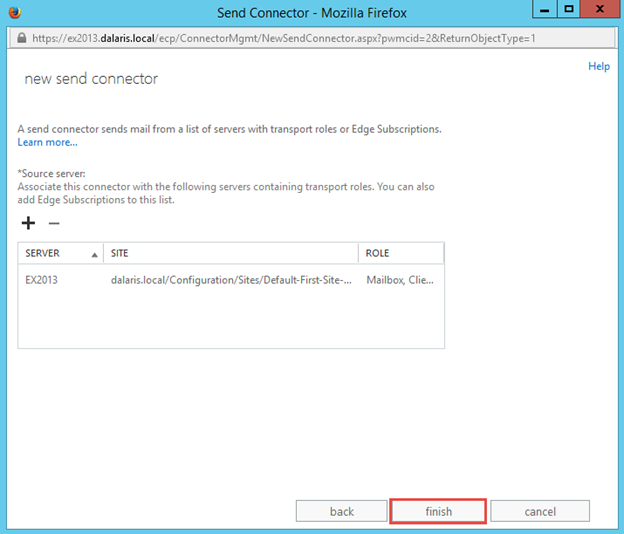 Click mail flow, send connector and then click the + sign. Fill information as follows and click Next. 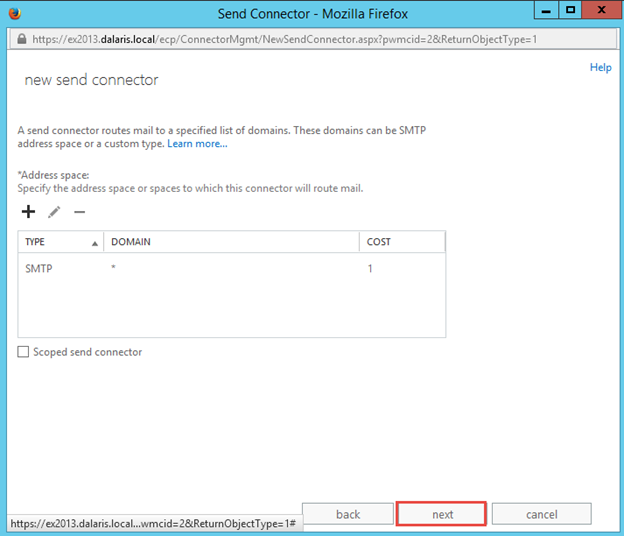 Click + to add a new Send Connector. 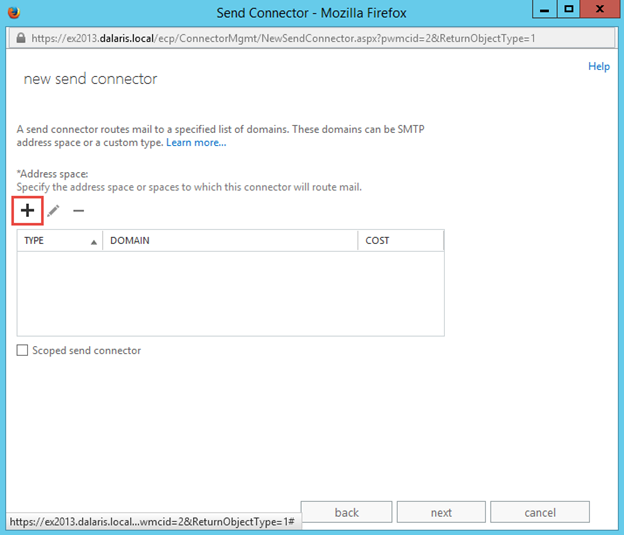 SMTP,*,1, also make sure there is an FQDN of exchange.dalaris.com. 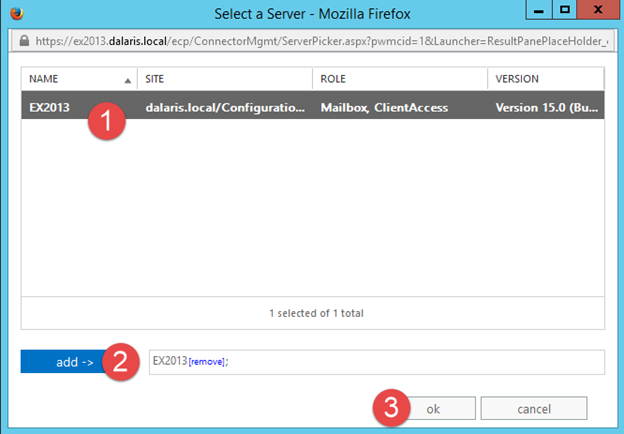 Click + to specify source server. 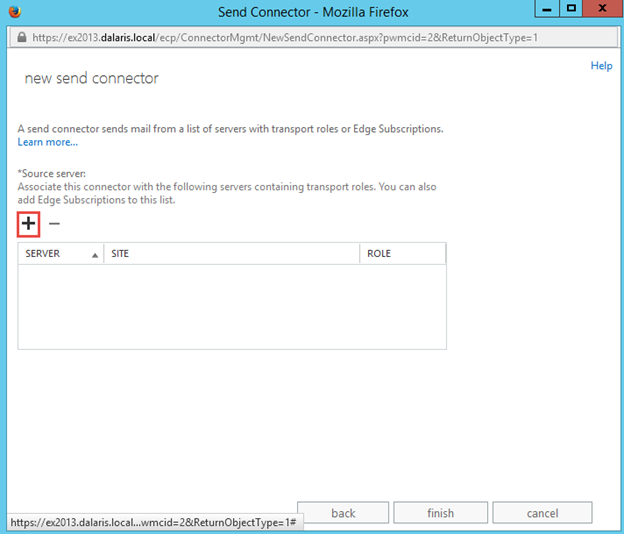 Highlight the server, click add, and then click OK. 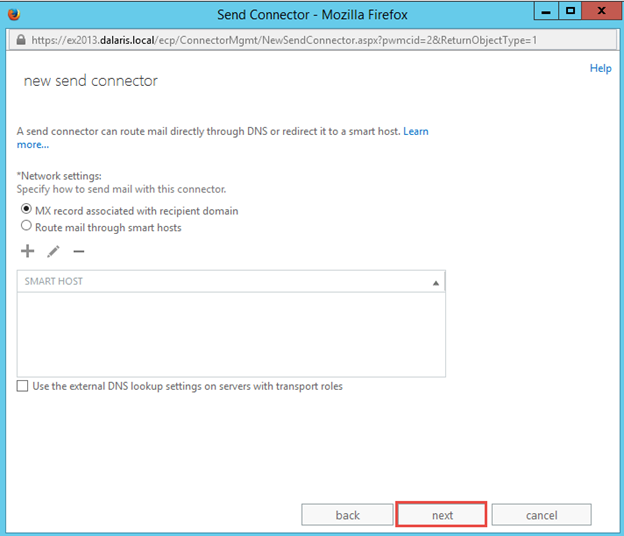 In order to be able to receive email, make sure you have the default receive connectors, don’t change anything. 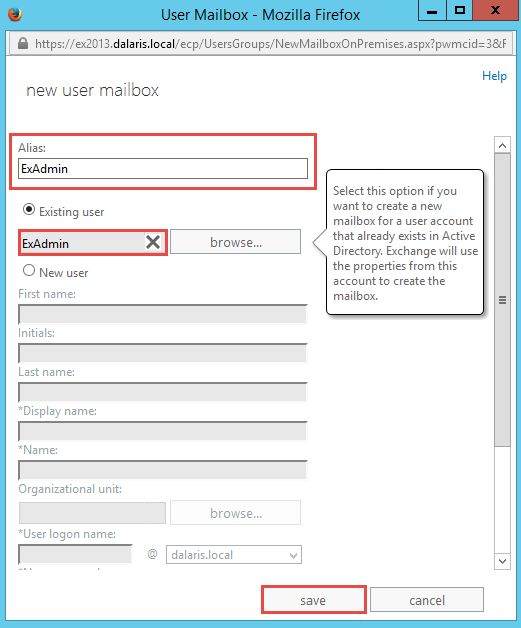 Let’s add a mailbox for ExAdmin. 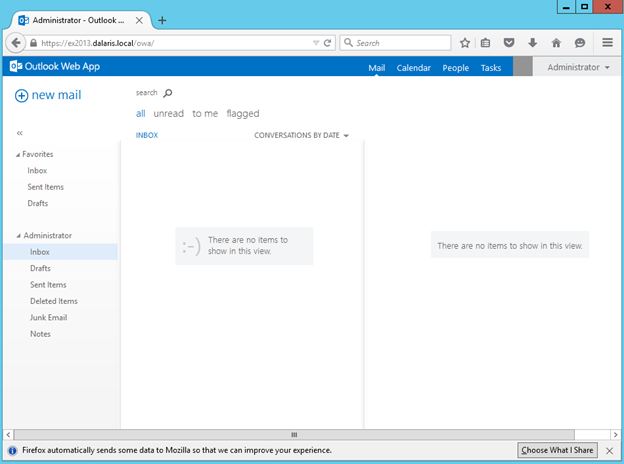 Click recipient, mailboxes, and click +. Enter the Alias as ExAdmin. 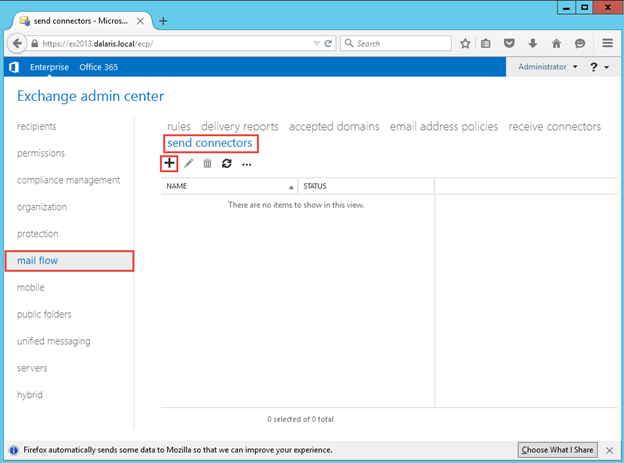 click Browse and choose the account ExAdmin. Hit Save. 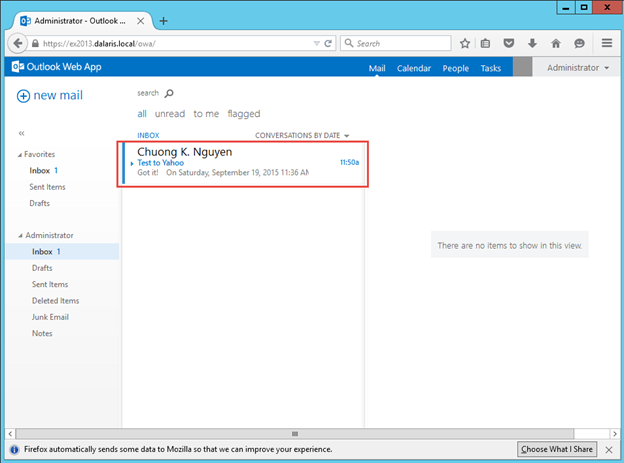 Now you should have two email mailboxes on our Exchange server. 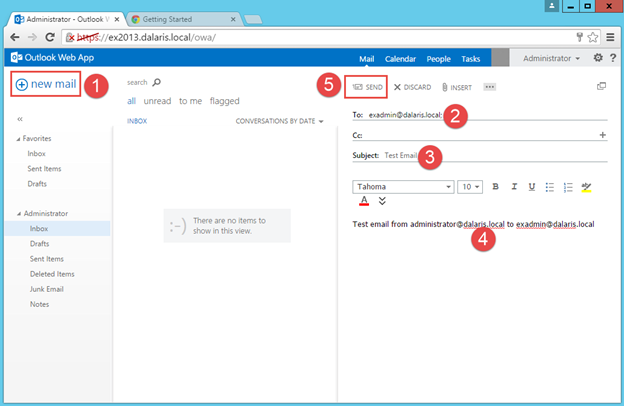 Use your favorite browser, access https://ex2013.dalaris.local/owa, log in as Dalaris\Administrator and send an email from administrator@dalaris.com to a Yahoo mail account. Check your Yahoo account and reply to the message. 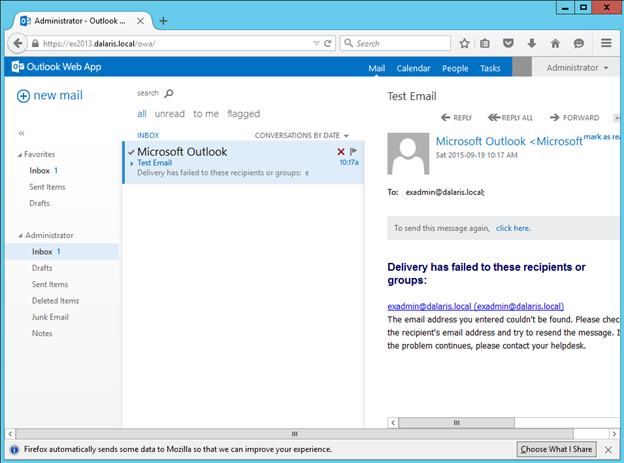 Check Junk of Yahoo if you do not see the email after a while. 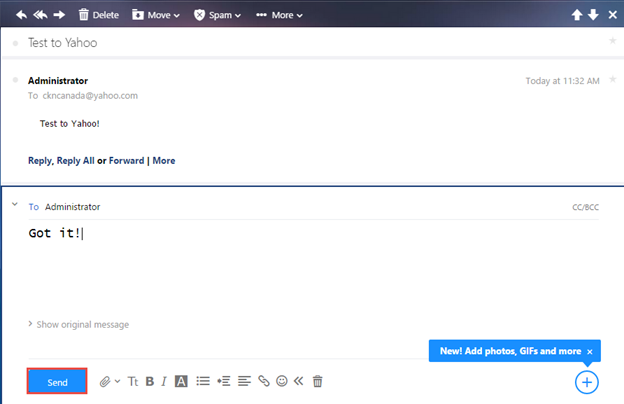 Let’s reply to that email from Yahoo! 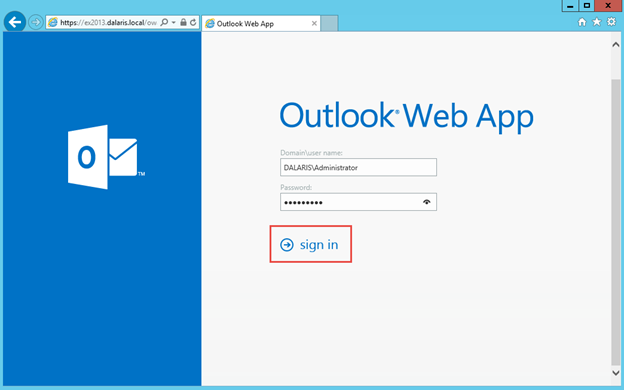 You should receive the email in the administrator’s inbox.